Being a dad might entail dirty diapers, but it also tends to come with big bucks. Men without children earned 40% less than their counterparts with children in 2010, according to a new study by The Graduate Center, City University of New York. And fathers made nearly twice as much as mothers. The findings suggest that dads are getting a boost on the job that others aren't seeing. "Parenthood is giving advantages to men but not to women," said Justine Calcagno, a social psychologist and author of the report. Correction: An earlier version of this story incorrectly stated that dads earn 40% more than childless men. 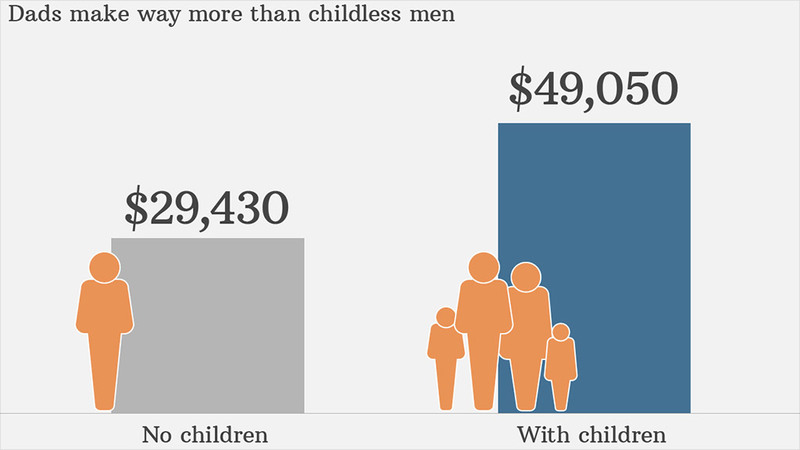 In fact, childless men earn 40% less than dads.